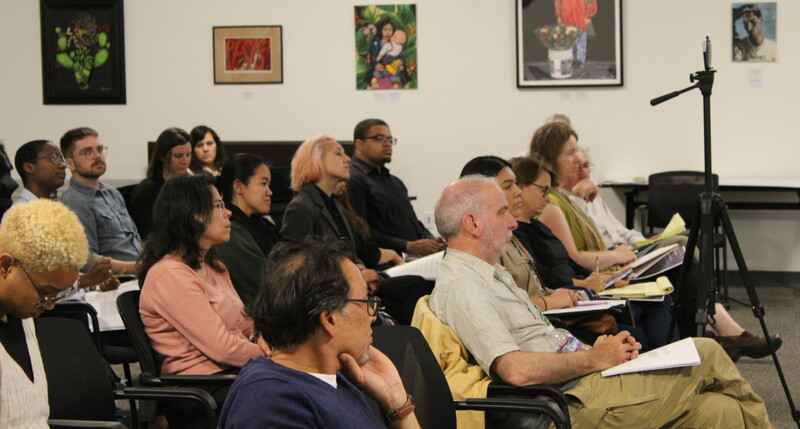 Media Coverage: "Opening the Door for Rent Control"
Audience members enjoy a presentation on the Haas Institute brief "Opening the Door for Rent Control" at the Greenlining Institute in Oakland, CA on Wednesday, Sept. 19, 2018. Below we've compiled a number of news articles about the "Opening the Door for Rent Control: Toward a Comprehensive Approach to Protecting California’s Renters" brief co-authored by Nicole Montojo, Stephen Barton, and Eli Moore. "With Prop. 10 dead, what’s next for California renters?" "Why Rent Control Is a Lightning Rod"
A supply of housing sufficient to meet urban needs in California will not be built for decades, if ever, and right now building doesn’t seem to be helping much. Many of the newer rental buildings carry high-end prices, while stock of affordable housing is actually falling. Given that, rent control is an easy and off-the-shelf policy tool that many people are familiar with — one that does help some renters and doesn’t appear to cost taxpayers money. “It is the best anti-displacement tool around,” said Stephen Barton, co-author of a recent report that called rent control a key measure toward stabilizing California’s housing market. And yet economists from both the right and the left are in almost universal agreement that rent control makes housing problems worse in the long run. Here’s what’s behind their thinking and the nuances of the debate. "It's expensive to be a tenant in California. Will Proposition 10's rent control expansion help?" More than half of California’s 9.5 million tenants are burdened by high rents, spending at least 30% of their income on housing costs, according to a recent analysis of U.S. census data by UC Berkeley’s Haas Institute for a Fair and Inclusive Society. The UC Berkeley Haas Institute report contends that rent control is the only way cities and counties can keep costs down cheaply and immediately. "So, you got an eviction notice and have a few weeks to find an apartment ..."
A report on protecting the state’s renters released last month by UC Berkeley’s Haas Institute for a Fair and Inclusive Society argues that rent control is necessary to ensure people like Chandler continue to have access to affordable housing. The report was authored by Nicole Montojo, Stephen Barton and Eli Moore. “The damage that gets done to people by displacement and by being forced into poverty by high rents taking so much of people’s income is much more severe than people normally seem to think,” Barton told me. According to their analysis, they estimate that 54 percent of the state’s renters are overburdened by housing costs. What’s more, they found that 73 percent of all jobs in California pay too little to cover rent. "With local initiative failing, UC Berkeley study emphasizes need for rent control statewide"
Differentiating itself from the previous studies—rent control, historically, has long been criticized by economists on both the right and left despite the fact that the list of theoretical harms often aren’t observable in reality—this study looks at the question of belonging and data-fies it: Who has the ability and right to stay within their community? Who does California belong to? "Proposition 10 has landlords and tenants facing off in California rent control battle"
More than half of California renters are “cost burdened,” meaning they pay more than 30 percent of their income on rent, the Haas report said. Stephen Barton, co-author of the Haas Institute report, maintains rental property should be regulated the way government regulates utilities. "UC Berkeley researchers boost rent control"
Earlier this month, UC Berkeley economist and real estate consultant Ken Rosen came out against Proposition 10, the November ballot initiative that would repeal the 1995 Costa-Hawkins Rental Housing Act and allow California cities to expand rent control. Two weeks later, UC Berkeley’s Haas Institute released a policy brief promoting the benefits of rent control for tenants and pushing back on some of Rosen’s criticisms of price regulation. Though the publication—titled “Opening the Door For Rent Control” and issued by Haas researcher Nicole Montojo (who holds a master’s degree in city planning from Berkeley)—does not directly address Proposition 10, the timing of its release is significant in light of the upcoming election. "Haas Institute policy brief highlights importance of rent control in solving housing crisis"
The brief, titled “Opening the Door for Rent Control,” proposes that rent control is the most cost-effective policy for stabilizing rising housing costs for Californians. The report highlights the necessity of affordable housing in the state and suggests a five-part strategy to tackle the housing issue. “In looking at the data about the crisis, it’s clear that the burden faced by renters needs to be addressed immediately and be a major policy objective when talking about how to respond to the housing crisis,” said co-author of the brief and Haas Institute housing research analyst Nicole Montojo. "Rent control can be 'useful tool' for cities to address CA housing: report"
Developers in California have railed against the Proposition 10 ballot measure that would give cities the ability to cap rent increases, claiming that more rent control will worsen the state’s housing crisis. But a new study by a UC Berkeley professor concludes the opposite, arguing rent control can be a useful tool cities can use to “address the immediate needs of California’s renters,” Curbed reported. The policy brief, by UC Berkeley’s Haas Institute, is the latest salvo in the debate over Prop 10, which would roll back the Costa Hawkins Rental Housing Act, empowering cities to cap rent increases on condos, single-family homes, and apartments built after 1995. "Santa Cruz Measure M fact check: Does rent control reduce rental supply?" Tenants are subsidizing landlords, according to researchers Nicole Montojo, Stephen Barton and Eli Moore at the Haas Institute for a Fair and Inclusive Society at UC Berkeley, who produced a policy brief this month making a case for rent control. The report has not been published in an academic journal. If California renters paid only what they could afford for housing, they would have $24 billion to spend, boosting other parts of the economy and reducing mental distress and potentially homelessness, their report said. More housing construction is needed, but only rent control will provide a near-term solution for renters, they concluded. This morning, researchers from the Haas Institute for a Fair and Inclusive Society at UC Berkeley presented a new report, which found that policies, including those allowing local communities to create their own housing policy to limit rent increases, are critically important tools to stabilizing California’s housing market. various policy goals, the goal of addressing the housing affordability and displacement crises facing overburdened renters must be prioritized,” Nicole Montojo, a Haas Institute housing analyst and co-author of the paper, notes. "UC Berkeley Housing Report Shows A Re-Segregation Of The Bay Area"
Further UC Berkeley research from the Haas Institute for a Fair and Inclusive Society, shows rent control policies are key to stabilizing the state's housing crisis. The research brief found that rent control, when applied with other housing policies, can prevent housing costs from spiraling out of control and forcing families to leave their neighborhoods. The analysis comes as California voters prepare to consider Proposition 10 on the November ballot. Currently, a 1995 state law prohibits cities from adopting rent control ordinances on single-family homes and condos as well as homes built after February 1995, the report said. If passed, Prop 10 would repeal the law, allowing cities to consider adopting rent control on all types of housing. "Conflicting reports seek to guide voters on Prop 10"
A new report from the Haas Institute at UC Berkeley said “rebalancing the dysfunctional housing market to restore fairness between renters and property owners” is in the public’s best interest. The report “Opening the door for rent control: toward a comprehensive approach to protecting California’s renters” estimated 54 percent of renters are overburdened by housing costs, and that 73 percent of all jobs in California pay too little to cover rent. The report’s authors say the dual crisis of housing and homelessness are intertwined, as the state’s most vulnerable tenants routinely choose between making rent and making ends meet. “When the housing market is as dysfunctional as it is in many parts of California, tenants are effectively subsidizing landlords with rent payments above what a fully competitive market would allow landlords to charge,” said the report’s co-author, Stephen Barton, a former housing director for the City of Berkeley. "UC Berkeley report says there's no housing crisis solution without rent control"
Three weeks before Californians receive their vote-by-mail ballots, a UC Berkeley social justice institute weighed in Wednesday on one of the election’s hottest issues, with a report that says the state’s housing crisis can’t be solved without rent control. Real estate interests have raised more than $20 million to defeat Proposition 10, which has effectively limited local rent control ordinances in the state. And a panel organized by real estate brokerage Marcus & Millichap earlier this month agreed unanimously that if the measure wins, rent regulations could sweep the nation and harm both the apartment industry and tenants. The report from Berkeley’s Haas Institute says that the primary anti-rent control argument — that such government regulation would reduce the supply of rental housing — is bogus and argues that government gains the right to regulate the rental market because it provides infrastructure and services that add value to private housing development. "Nicole Montojo discusses Rent Control Report on KTVU"
"Proposition 10 a Key Issue in Bay Area Housing Crisis"
As Election Day approaches, homelessness is one of the issues on the minds of many California voters, likely making Proposition 10 a contentious item on the ballot. If Prop. 10 passes, cities and counties will be able to adopt stronger rent control laws. But not everyone is on board. Opponents of the proposition say it will slow the production of new units for low-income families, the people hardest hit by the housing crisis. Supporters of Prop. 10, on the other hand, say the state needs to protect overburdened renters who are not just being pushed out of their neighborhoods but out of the state. "It’s almost like being a sharecropper," Oakland resident Merika Reagan said. "You work so hard just to have a roof over your head." "UC Berkeley report defends rent control in California cities"
In his paper, Rosen argues explicitly against Proposition 10, which would repeal the Costa Hawkins Rental Housing Act and give California cities the ability to cap rent increases on condos, single-family homes, and apartments built after 1995 (though cities would not be required to do any of these things). The Haas Institute policy brief, on the other hand, does not mention Proposition 10 and represents a broader defense of rent control policies.